This Friday, July 1 is the Mid-Year Bank Holiday. Many banks will be closed but otherwise it is not a public holiday and all government offices will remain open. After recent heavy rains caused flooding in Nan, killing two and seeing the province declared a disaster area, more rain is forecast for the North this weekend, according to the Thai Meteorological Department. People living in Mae Hong Son, Chiang Rai, Chiang Mai, Phayao, Nan, Phrae, Uttaradit, Tak, Sukhothai, Nakhon Nayok, Chanthaburi and Trat should be aware that heavy downpours may trigger flash floods over the next few days. 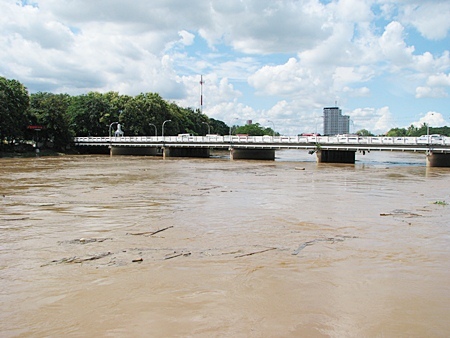 Officials from the Department of Disaster Prevention and Mitigation are monitoring water levels in area rivers on a 24-hour basis and is monitoring overall conditions in the affected provinces. Tropical Depression Haima brought downpours to Chiang Rai and the water level in many rivers continues to rise. Lamphun authorities have warned the public of the river overflow as well both in Muang District but also in Pa Sang, Mae Tha and Ban Hong Districts. Phayao has seen four districts declared disaster zones as provincial authorities distribute relief packages to villagers cut off by the floodwaters in Chun, Pong, Chiang Muan and Chiang Kham Districts. 7 passengers in a yellow transport songthaew were killed when the truck they were riding in hit a 10 wheel truck head on after attempting to overtake a vehicle in front. The driver of the yellow songthaew was attempting to pass a vehicle in front as it travelled down the Doi Saket-Chiang Rai road when it struck the 10 wheel truck head on, killing 8 including the driver of the 10 wheel truck. 4 men and 4 women died in the accident, while the driver of the songthaew, 21 year old Nattapong Kaewsukham and two other critically injured men were taken to hospital and later transferred from Doi Saket to Chiang Mai due to the severity of their injuries. Police believe heavy rain and poor visibility contributed to the accident, along with the poor judgment of the songthaew driver. A local business has chosen an different kind of name to attract customers! 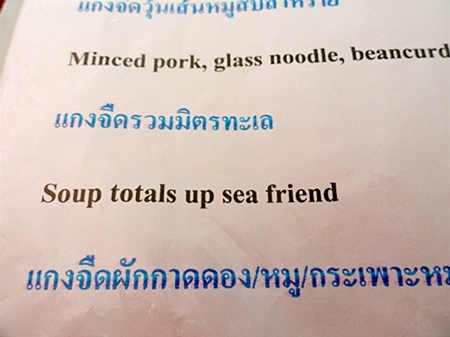 Sometimes, translations from Thai to English lose something in the meaning. Other times, people should just use their spell checkers! But many of the signs offer us something fun to read and see as we make our way around Chiang Mai. The Chiang Mai Mail invites our readers to send in their favorite quirky “engrish” photos for the paper. Please send all submissions to [email protected]. Many thanks to reader Ron Lister for these photos! An old RPG missile was found by students at Wat Pa Paeng Municipal School on Thursday, June 23, Thai Channel 3 reported today. Over 500 students were evacuated from the school as the bomb squad suited up and defused and removed the bomb. Nobody was injured in the incident but this is the second such bomb to be found on the school in the last 5 years. Soil from the moat was used to fill the field for students and Region 5 Police believe that the missiles were thrown into the moat and then when the soil was dredged were transferred to the football field. A grenade exploded at Kawila Army camp, in another report, killing one soldier and injuring TAN Network reported yesterday. Private Chai Kattithin was killed when the M26 grenade exploded and Private Wanlop Tana was critically injured. Third Army Region Commander, Lieutenant General Wannathip Wongwai reports that it was not a political incident but rather they believe that Private Chai was believed to have been playing with the grenade when he accidentally removed the safety pin and the grenade exploded. However, they do plan to investigate the incident further to find the origin of the grenade. City officials inspect dredging operations along the Ping River. 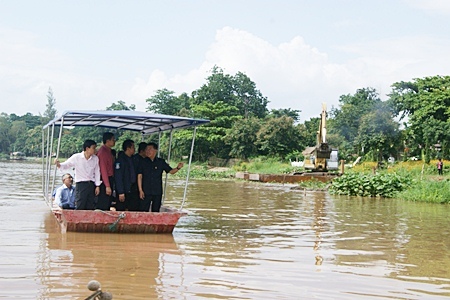 Chiang Mai Mayor Tussanai Buranupakorn inspected dredging operations on the Ping River in preparation for the upcoming rainy season on Wednesday, June 22. Joined by Marine Department officials the concern remains that the river level is high and the silt has built up, causing concerns that heavy rains could cause the river to overflow. Dredging operations began in May. Additionally, the municipality is preparing for the rainy season by getting ready to prepare sandbags when the rainy season starts. These will be distributed for free along the river front to concerned businesses and homeowners who will be able to pick them up at distribution points at the Municipality and other locations to be announced. The Ping River nearly overflowed its banks in September, 2010 after heavy rains in Mae Taeng sent a high volume of water down the river. The Municipality announced that the plans to dredge the Ping River before the onset of the rainy season in an effort to avoid overflow and flooding in case of heavy rains have been moving forward as scheduled. The province’s reservoirs are not as low as usual due to the unseasonal rain during the normally dry season so dredging the river is one project to protect the city from flooding. Dredging has been taking place in shallow areas of the river including the area opposite the Municipal Building, the Iron Bridge, in front of Wat Faham, and near Nawarat Bridge. The dredging operations, operated by the Marine Department and other city agencies, remove excess silt that has built up and increase the depth and speed of flow of water through the river. The Chiang Mai Municipality announced the figures for the fiscal year of 2554 (2011) with total projected revenue estimated to be 980,043,000 Baht and total estimated expenses at 945,411,000 Baht. 21 projects have been set forth and include construction of a Child Development Center, repair of wastewater pipes and drainage, repair of bridges, purchase of land for a green space, improve paved roads in the countryside, construction of roads and drainage systems in various areas around the city, as well as the purchase of new manhole covers. The majority of the projects will be drainage system construction on roads around the city in a bid to lessen street flooding during heavy rains. Mobile services are being dispatched to various areas around the city to serve residents every weekend; offering everything from rabies shots, eye exams, haircuts, tax advice, birth registration, to legal counsel and more. Last week saw Mayor Tussanai Buranupakorn drop by the mobile unit on Kawila road.This Saturday, June 25, services will be available at Wat Nantharam on Mengrai Road from 9 a.m. to 1 p.m. For more information call 053 -259094. ThaiRath online news reported that a 20 year old Dutchwoman was caught by a security guard on the roof of the North View Rent-a-Car building on Sunday, June 19. Reportedly, she told police that she and two Australian friends had climbed up onto the roof for the drunken prank when part of the roof collapsed, damaging a car below. The two Australians fled but the Dutch woman was allegedly too drunk to get away and was held by a security guard until the police arrived on the scene. ThaiRath reports that she has offered to pay damages. Planking is the latest fad to sweep the internet which started in Australia only recently. It involves people posting pictures of themselves on Facebook lying face down with their arms and hands touching their sides with the photos taken in unusual locations. People playing this game compete to find the oddest locations and the point is to make it as public as possible with as many people involved as possible. City residents were frustrated by the last minute clouds that rolled in just as the eclipse started in the early morning hours of June 16, 2011. The Observatory set up public observation of the eclipse for interested residents but the cloud cover blocked the peak of the eclipse and the clear red of the moon was not visible to bystanders. 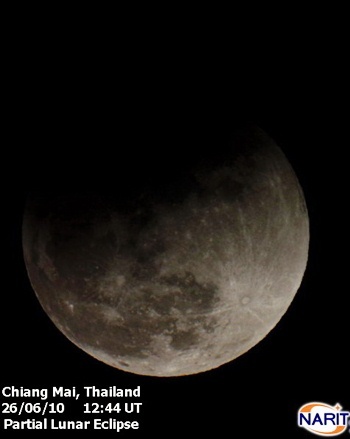 Reports from Songkhla report that the skies there were clear and viewing of the eclipse quite clear. 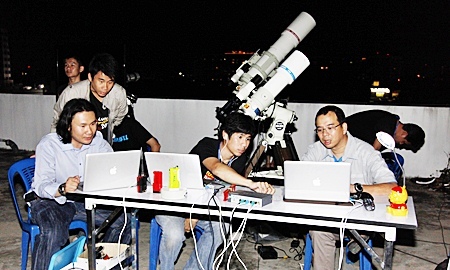 NARIT researchers offered interested residents lectures on the phenomenon on their rooftop observatory at Huay Kaew Road. The National Astronomical Research Institute of Thailand (NARIT) reports that for those who missed this eclipse can be seen on December 10 of this year when the normal winter conditions of clear and cool nights may ensure better viewing. The bruised semi-naked body of a Thai woman aged between 50-55 and about 150 cm tall, was found floating in the river near the bridge in Padaed on June 15 at 7 p.m. Authorities plan to conduct an autopsy but do not believe she drowned. They have called for anyone who might know of her identity to contact the police. The next day, on June 16, the body of a 51 year old Lamphun man was found after his car crashed into a fence in the early morning hours of June 16. The body was not found until several hours after the accident occurred as area residents said they had been sleeping and did not hear the accident. Police believe the driver may have suffered a heart attack or some other illness that caused the accident. In other local news, a fire broke out at Prince Royals College on Thursday, June 9 at 2 a.m. damaging a room on the 3rd floor of one of the buildings. Fire fighters were able to get the fire under control after about an hour. No injuries were reported and damage is estimated at about a million baht. The fire department plans to investigate the cause of the fire. School Director Neil Amas, right, enjoys bread baked by nursery school students at Panyaden. We’ve all seen the signs for the new International School in Chiang Mai promoting a green policy following Buddhist principles and perhaps wondered what that was all about. Do the kids have to meditate every day or something? And what do they mean by green? 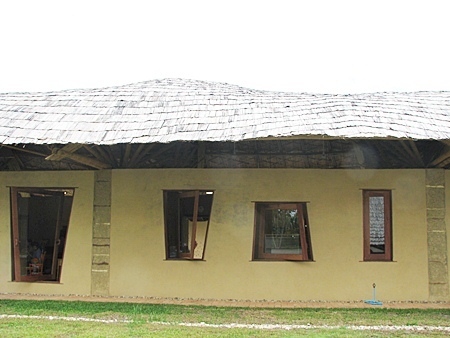 Built almost entirely of organic materials such as rammed earth and bamboo, a renewable resource, Panyaden School also utilizes food waste to create biogas for cooking. Although they don’t produce enough at the moment and so must supplement but they expect as the school grows, so will their ability to provide their own cooking gas. Additionally, all the water is filtered and purified and therefore potable, eliminating the need for the import of drinking water. And finally, the building is processing its own wastewater with the aid of a leading Bangkok company that provides green waste management systems. The thick walls of the rammed earth buildings insulate them to keep them cool in the heat and warm in the cold, thus negating the need for costly air conditioning. Children and staff are all encouraged to save energy by turning off lights and fans when not needed. The buildings utilize recycled materials and yet the notion of being green doesn’t detract from the fact that the buildings are uniquely and interestingly designed and the campus safe and clean for the children. Neil Amas is the Director of this new school; recently opened they offered summer classes and have now opened for their first school year. Neil is no stranger to Thailand, having lived here from 1989 for 9 years, where he worked in education with Cambodian refugees at Phanat Nikhom in Chonburi. He moved back to the United Kingdom for 10 years with his wife, a Thai native who also taught at the refugee camps, where he worked further in education in London. He moved back to Thailand in October of 2010, he and his wife choosing Chiang Mai to raise their two children as a much better alternative than a large city like Bangkok. He was offered the position of School Director shortly after he moved here when he met one of the school’s founders Yodphet Sudsawad. Panyaden encourages their students and teachers to follow Buddhist principles. “We aim to adopt a way of life at school embedded with Buddhist values. Not just what we believe but what we teach, we lead by example.” Social responsibility, compassion, objectivity and calmness are the mainstays of that, and it can be seen in day to day life where children wash their own lunch dishes and where teams of students take turns cleaning the campus at the end of each school week. They encourage individual thinking and inquiry based integrated learning, wanting to students to see and experience and decide for themselves. The “Art of Living” is given to all teachers and they are expected to go on a meditation retreat at some point. 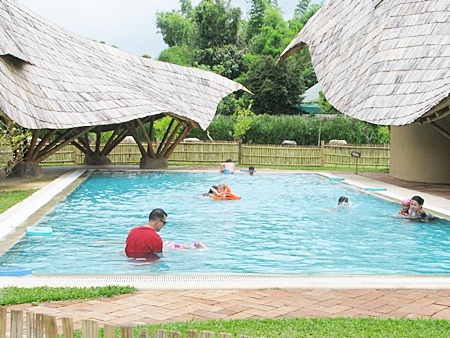 Neil plans to give the retreat in Lamphun a try. He said they recently had a walking retreat that many of the teachers took part in. They do encourage yoga and meditation and offer weekly sessions, additionally they provide periodic sessions on Buddhism with Ajahn Jayasaro, who came to Thailand 30 years ago to become a Buddhist monk and who regularly teaches in both his native English and fluently in Thai. Neil added that it’s not a requirement that teachers be Buddhist, just that they have openness and willingness to self develop. Thai teachers, which comprise half of the team, took nearly a full year of training to learn the integrated approach to learning before the school even opened. They offer classes from nursery (age 2) to Prathom 6 (age 12). 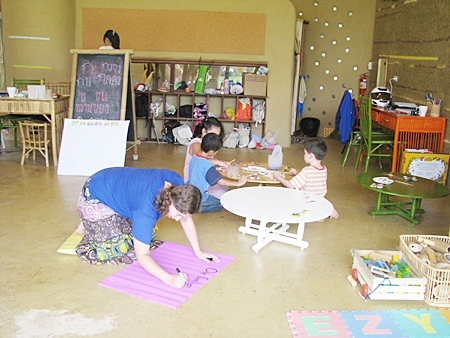 All classes are taught bilingually, with both a Thai teacher and a native English speaking teacher. Thai teachers speak only Thai and the English speaking teachers speak only English with the students. Neil said that in the early years they encourage verbal skills, where the youngest children speak their own language but are exposed to another language. “The same as with bilingual parents where the Thai parent speaks only Thai,” he pointed out. Around the age of 5 they start to introduce basic literacy, phonics and the alphabet. Prathom 1 sees the children introduced to their strongest language, starting with reading and writing. 5 hours a week in this with one hour a week in the second language. All other subjects are still bilingual. “Giving them a strong foundation in the one language allows them to develop the other,” Neil added. By Prathom 3, the secondary language sees study hours upped and then by Prathom 5 they spend equal amounts of time in both. Neil noted that some parents of young children who started the school speaking only Thai have already noted in the short time they have been there, that their child’s English speaking and comprehension has grown.”Young children are sponges and pick up language very quickly,” Neil pointed out. This was amply demonstrated when some Nursery students burst happily into the office offering bread they had made themselves, albeit with teacher’s help! “The kids love going to school here, they enjoy staying here and don’t always want to go home at the end of the day!” Neil concluded. The smiling faces of the children in both playground, pool and classroom certainly attests to the enjoyment these children gain from going to school. Children enjoy developing their creative skills in Art class. School headmaster Michel Thibeault does double duty as swimming instructor in the school pool, keeping kids active and stimulated both physically and academically is important to their development. Markus Roselieb, owner of Chiang Mai Life Construction firmly believes that not only should new construction be green friendly but also source local materials in order to leave a smaller footprint on the planet. 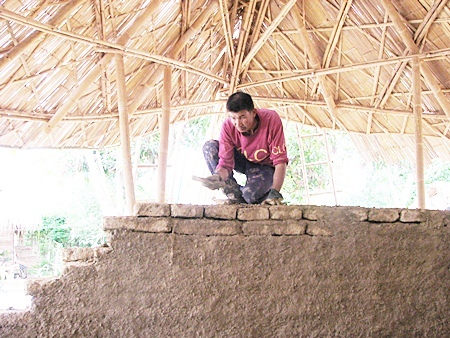 To that end his company is constructing rammed earth, wattle and daub and adobe buildings using bamboo for roofing, from the timber bamboo structural supports to the bamboo roof tiles. The whole thing is weatherized by locally sourced linen, tarred and then used in between layers of more bamboo in order to waterproof the roof. 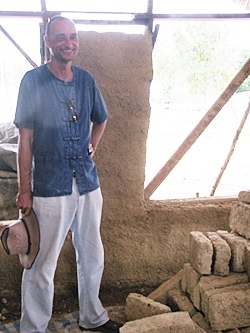 Markus Roselieb of Chiang Mai Life Construction shows the adobe construction of the new building. These construction styles hearken back thousands of years and have become popularized in the West for some time but many thought the tropical climes of Thailand would not yield promising results. The beautiful rammed earth buildings built at Panyaden School are testament to the fact that this green building technique can work here. Additionally, they have tested out the viability of adobe and wattle and daub construction as well and found with all three types that a good foundation that keeps the walls dry is quite successful. For those who are new to this technique, rammed earth is almost exactly what it sounds like; the compression of soil containing sand, clay and gravel between formwork to make a wall. It can then be plastered in adobe or left naturally, showing the striations of the different earth as it’s poured and then compacted into the forms. This technique is considered as having one of the lowest impacts in construction as it uses locally sourced lower subsoil and the top soil can be used for agriculture. The formworks can be reused and, in the case of Chiang Mai Life Construction, bamboo, a renewable resource, is used for the roof. The temperatures in rammed earth buildings are significantly lower as well, further reducing the need to energy consumption by lowering cooling costs. Wattle and daub is another ancient technique the Markus expounds at his site. A wall is constructed out of a woven lattice of wooden strips, in this case bamboo again, the wattle in wattle and daub and then covered with a damp mixture soil, sand and straw to make the “daub”. Wattle and daub construction was used as far back as the Neolithic times and its low impact, low cost construction is seeing it become popularized. Finally, there is adobe, adobe bricks are created from a mixture of clay, sand, gravel, and even large aggregate with a straw and water. The resulting mixture is poured into forms to make brick blocks. These are then dried and shaped to be used to build walls. Used for thousands of years around the world, the word became synonymous with the Southwestern Native American Pueblo tribe in the United States who built their pueblos out of adobe although the actual word “adobe” can be traced back thousands of years virtually unchanged. Chiang Mai Life Construction has started holding workshops to teach these various forms of construction and are currently building a house in order to determine the exact costs, both in labor and in material that a small two room house would run. The fluid designs of the buildings certainly blend in and create a unique view as can be seen at Panyaden School where all of the buildings have been constructed using green techniques such as rammed earth and using bamboo for most wooden structural requirements. Chiang Mai is working hard towards becoming a green city and its important to note those who are contributing actively towards this end. More information about Chiang Mai Life Construction and their green building techniques can be found at http://www.chiangmailifeconstruction.com/. One of the builders sets the adobe block wall into place. One of the rammed earth buildings completed at Panyaden School. 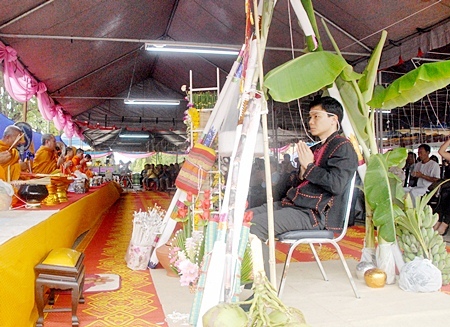 Former Rak Chiang Mai 51 security guard, Niyom Lueangcharoen, also known as DJ Lae, who recently turned himself into authorities on Thursday, June 9 after being on the run for more than a year, had shots fired at his home in San Kampaeng on Monday, June 13, 2011. Nobody was harmed in the incident but the building, which is also a shop selling handicrafts in the family compound, was damaged by multiple bullets. He told reporters that he believed the shooting was from former members of the faction who were attempting to silence him from possibly giving police information. Niyom was sentenced to 20 years in prison along with 4 other men in April 2010 for the murder of Settha Chiamkitwattana, the 60 year old father of a Yellow Shirt supporter in Chiang Mai, who was dragged out of his truck by Red Shirt demonstrators and beaten. Settha was found dead with a gunshot wound by police after the Red Shirts retreated. However, DJ Lae skipped bail and, after the violence in May, fled the country. He only recently returned and turned himself into the police who allowed him to return home. Chiang Mai residents may not have noticed the 3.6 earthquake that was recorded by the Seismograph station on Sunday, June 12 as it was very minor and caused no damage. The epicenter was in Tha Ton of Mae Ai district and is part of the Mae Chan faultline. The last earthquake of any size to be felt in this area was a 4.6 earthquake 146 km (91 miles) ESE of Myitkyina, Myanmar, or 960 km NNE of Yangon on May 31 and a magnitude 3 earthquake reported on May 25 with the epicenter situated between Galyani Vadhana and Samoeng districts. Chiang Mai is situated on 3 fault lines including Mae Chan, Mae On and Mae Tha. The province already has the emergency plan in place and has carried out emergency drills many times in the past. Residents have been informed how to deal with earthquakes and to spot signs that an earthquake is coming and how to act when one strikes. 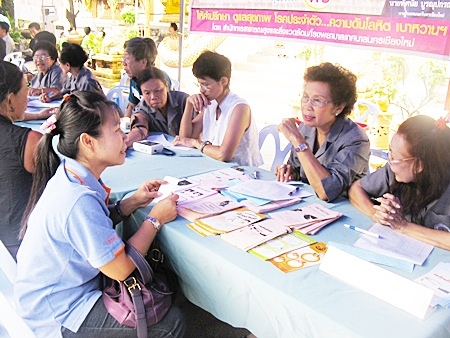 As part of an ongoing campaign to provide services to needy residents of Chiang Mai, the municipality visited Wat Lam Chang Ping on June 11 to provide rabies vaccinations, birth control for dogs, mental health counseling, services for the elderly, mosquito repellent, birth and death registration advice, and officials from the Bureau of Finance offered advice on local taxes and other issues. Many locals turned out for the day long event which also offered barbering services, dental checks and eye exams. DJ Lae, or Niyom Luangsiri, a former DJ on the Red Shirt radio station, and wanted by the police since the violence in May of last year, surrendered to police after more than a year on the run, the police reported on Friday, June 10. DJ Lae turned himself into the Provincial Police Bureau Region 5 Commander Somsak Chanthaping stating that he wished to vote in the upcoming election and that is why he turned himself in. He was wanted for involvement in the attacks on the Provincial Police Headquarters and the Royal Center. While initial reports state DJ Lae as Niyom Luangsiri, a DJ Lae named Niyom Luangcharoen was convicted in 2010 for the murder of Settha Chiamkitwattana, the 60 year old father of a Yellow Shirt supporter in Chiang Mai, who was dragged out of his truck by Red Shirt demonstrators and beaten. A gunshot was heard and Settha was found dead by police after the Red Shirts retreated. Niyom was convicted in April of 2010 but jumped bail and was then seen at the Rajaprasong demonstration. 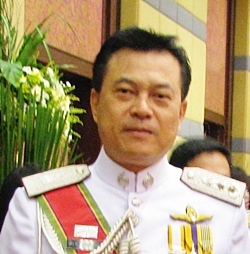 DJ Lae claimed to have hidden in a neighboring country with the help of other Red Shirt supporters and denied any involvement in the violence in May, or that he held 11 hostages at a resort in Mae On or that he was involved in the grenade attack on the Chiang Mai offices of Kanaen Supha, the father in law of Bhum Jai Thai de facto leader Newin Chidchob. As part of the annual two week long Inthakin ceremony to bring prosperity and prolong the life of the city, Chiang Mai Mayor Tussanai Buranupakorn was joined by Municipal staff and local residents performed the pithee suab jata muang at the four corners of the moat, the five city gates and at the 3 Kings Monument on Thursday, June 9, 2011. (Photo courtesy of Chiang Mai Municipality). 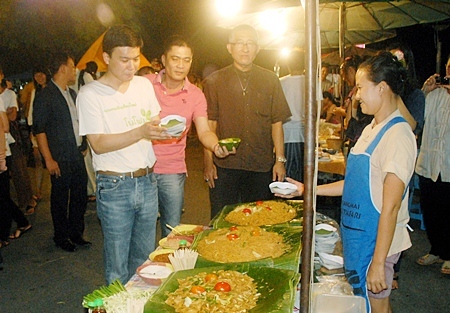 The Municipality instituted a program to encourage food sellers on the Sunday Walking Street market to switch over to paper or natural materials from non-biodegradable foam containers in a bid to reduce litter and pollution and push the market towards being more environmentally friendly. 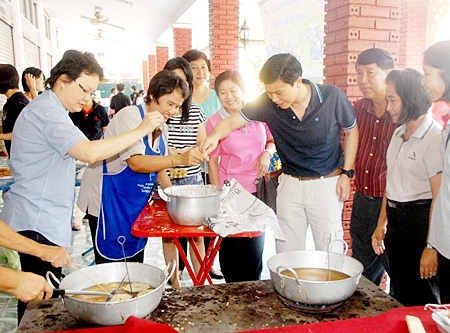 Chiang Mai Mayor Tussanai Buranupakorn, pictured here with a food vendor, buys a snack wrapped in paper. The Municipality is also working to encourage disabled vendors to use the markets. (Photo courtesy of Chiang Mai Municipality). 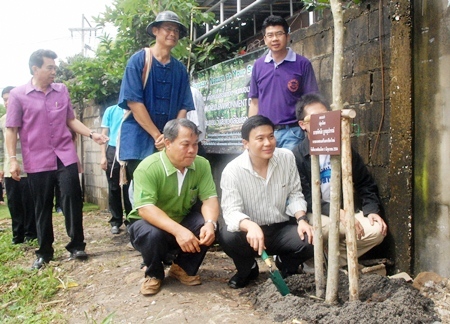 Chiang Mai celebrated World Environment Day on June 5 by planting trees at Mae Kha Canal. World Environment Day was established in 1974 by the United Nations and has grown to be a worldwide annual event pushing for positive environmental work and change. This year saw both governmental and private organizations take part in planting trees in a bid to restore the Mae Kha Canal. Many local residents showed up early morning to take part in the activities that carried on despite the heavy rains of the night before. 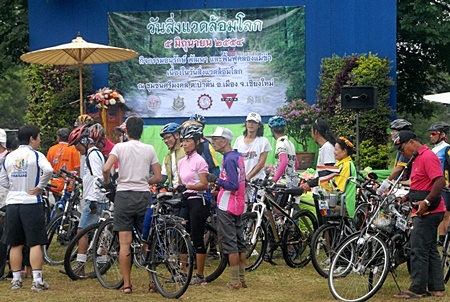 Chiang Mai Mayor Tussanai Buranupakorn joined in the tree planting activities that had been organized to help conserve and restore the local environment. Commander of the Immigration Bureau Region 5 Thitirat Nongharnphitak reported that Canadian citizen Shmilov Herzel, 29 has been arrested for selling drugs along with his 20-year-old Thai wife Thasani Klanklin, and an associate, Phichet Pheungsai, 39 at their restaurant in Chiang Mai. The couple have been operating the Falafel King restaurant on Chai Sri Phoom road and selling drugs out of the store front. Two tourists filed a report with the police after they claimed they had bought drugs from the restaurant and then Phichet masqueraded as a police officer and attempted to extort further money from them. The Immigration and Region 5 Police said they had been alerted to the activities of the group by the U.S. Drug Enforcement Agency earlier last month and that they had been under investigation since that time. The DEA informed the police that the Canadian suspect was wanted on drugs charges in both the United States and Canada. An alleged fourth gang member is still at large. The three suspects were arrested by police after a warrant was issued by the Chiang Mai Provincial Court. Despite delays in the construction of the new Chiang Mai Bus Station, the projected completion date is now set for July of this year instead of the originally scheduled May. The project has a 160 million Baht budget and the two story L-shaped building will feature air conditioned waiting areas on the second floor and computerized monitors showing real time departures and arrivals. Ministry of Transport officials believe this newly designed Bus Station will be able accommodate a significantly higher number of passengers in greater comfort and added that the new station will feature many of the same features as an airport. They added that special buses to the Royal Flora exhibit will be implemented for the ease of visitors. Additional parking will be an added convenience for bus station users. This NARIT photo shows last year’s partial eclipse taken from the Doi Suthep Tower Observatory. 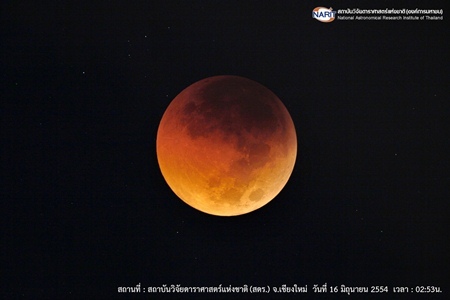 The National Astronomical Research Insitute of Thailand (NARIT) invites Chiang Mai residents to join them on Doi Suthep at the Observatory Tower to view the lunar eclipse which will begin at 1:22 a.m., reach full stage at 2:22 a.m. and end at about 4 a.m. on June 16, Saran Posayajinda from NARIT said. The moon pass in front of a star called 51 Ophiuchi, which will appear to be a glowing red light travelling behind the moon. "In case there are clouds or rain that can obstruct a glimpse of the eclipse, which is not possible at all three locations, it will be recorded through telescopes," Saran noted. The Meteorological Department predicts continued scattered showers for the coming week.